Fischer-Tropsch Synthesis of green diesel from synthesis gas. 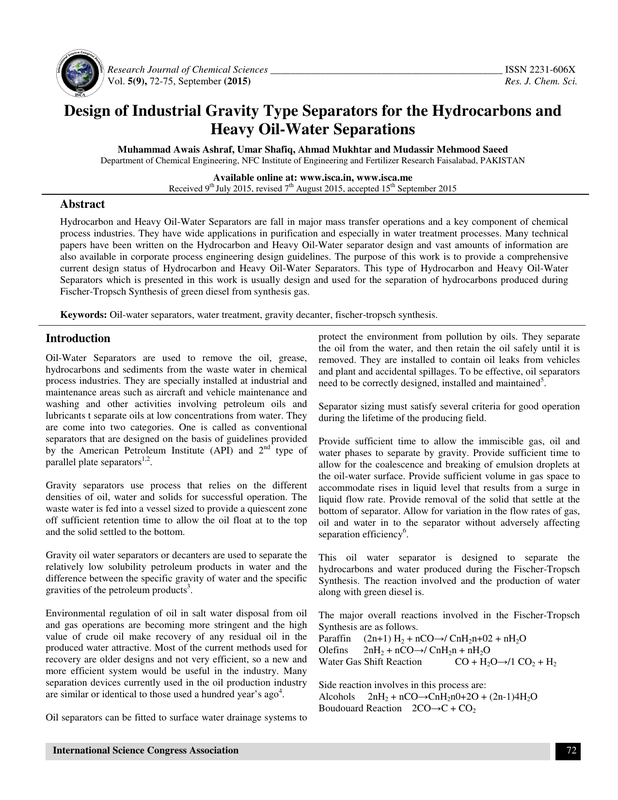 Keywords: Oil-water separators, water treatment, gravity decanter, fischer-tropsch synthesis. need to be correctly designed, installed and maintained5. during the lifetime of the producing field. and the solid settled to the bottom. gravities of the petroleum products3. along with green diesel is. are similar or identical to those used a hundred year’s ago4. 0.096 cp.µ,L =Viscosity of Light Liquid Phase. = 0.167 cp. phase while light phase (hydrocarbons) are continuous phase. Viscosity of Hydrocarbon = 0.167 centipoise. flow rate in the continuous phase can be calculated as9. between 2 and 5 here L/D = 2 which is satisfactory . cylinder this means liquid depth is 90% of tank. 58.61m3, Diameter 2m and Height 4m. heavy oil, hydrocarbon-water separators as follows. Feed = 3038.31 K mol/hr. Lighter Fractions = 1772 K mol/hr. Heavier Fractions = 1181.56 K mol/hr.